Last time I wrote about my plans to walk the Yam le Yam trail in northern Israel, despite it being the peak of summer, and how much I love this trail. 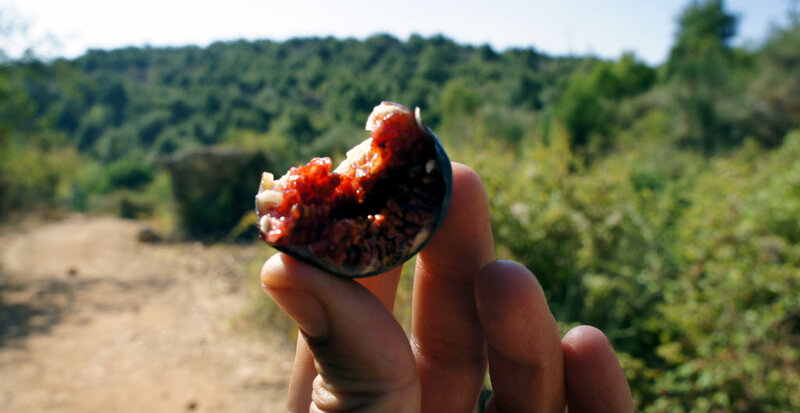 The Yam le Yam is a truly Israeli classic and features some of the greatest that Israel has to offer in terms of flora, geology and climate. First, a small translation: “yam” means sea in Hebrew and “le” is to, so the Yam le Yam trail is a sea to sea trip. You can make several sea to sea trips in Israel, connecting the Mediterranean with several other bodies of water: the Red Sea, the Dead Sea or the Sea of Galilee. My favourite of those, and the most recognised one, is from the Mediterranean to the Sea of Galilee – the real Yam le Yam. This trail leaves the coast of Keziv in the north of Israel, follows the route of Keziv stream, then Neriah stream, climbs to the peak (almost) of Mt Meron, down to Meron stream and then follows Amud stream all to way to the Sea of Galilee. 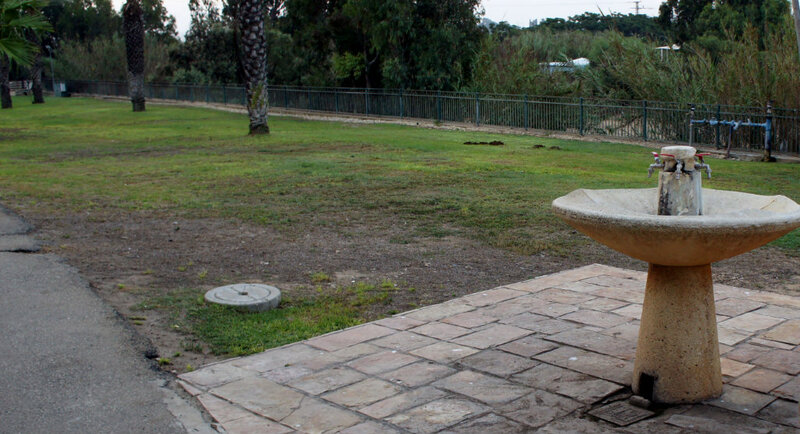 Yam le Yam is a real Israeli classic: every outdoors-oriented school, youth movement or outdoors recreation group had done the trail, in parts or whole. 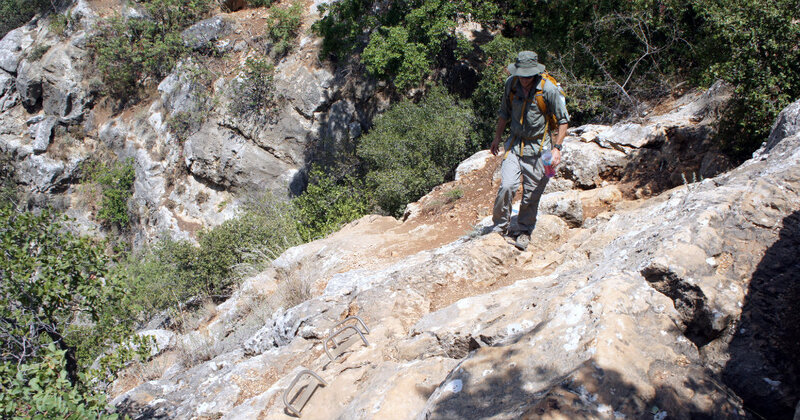 The trail is set in the Northern (upper) Galilee, which is characterised by high ridges and deep streams, and climbs to the highest mountain in the region: Mt Meron (1,208 m above sea level). Lately the trail has even got its own marking: a purple dot near the trail markings along the way. So while in Israel, on a random Tuesday night, I met a good friend of mine from my army days at the Nahariya train station to try our luck in walking 70 km in 2 days in the peak heat of summer. Temperatures were expected to be in the range of 30-35ºc (85-95ºF) so we planned for lots of water, early starts and as much shade as we could find. As always, our biggest problem was finding reliable sources of water along the route, but as it is always true when hiking in Israel (out of the desert) – you are rarely further than 5 km from a place of habitat. After meeting my friend quite late at the Nahariya train station (trains from Tel-Aviv, Haifa and more), we sourced some more water and pastries for breakfast and headed to the sea: directly west from the station along Ha’Gaton road. Nearing the marina we took the last road north (Hamaapilim) in order to find the beach trail that is just north of the city. The beach trail is very nice but the weather was humid and sticky, making what comes next truly terrible. Walking on the beach for a couple of kms, we reached a section of the beach that was closed due to being a bio-hazard: an old asbestos factory is being dismantled after poisoning the area for decades; this forcied us to head east, to the main road (highway) north: route 4. After a couple of kms on the dark side of the road, dodging traffic and shrubs, we tried our luck again in reaching Keziv beach on the shore line just to reach a closed and private beach (illegal in Israel….). We headed back to road 4 for a bit more of scary road walking and after another km reached our camping spot at midnight, after 8.2 km (5 miles) and two hours of sweaty walk. On Keziv beach we inflated our mats and got our sleeping sheets out, had a night cap and some snacks and were off to bed, despite the noise from nearby campers and the relentless light from the road. This walk used to be really nice, along the shore line with the beach hardly accessible to cars. Today, this walk is hard, blocked and unwelcoming, and sleeping on the beach is not a very pleasant experience. I recommend skipping the whole walk, just take a taxi from Nahariya to Keziv beach (to the Yad le Yad memorial, “undurta” in Hebrew) for 30-50 NIS, about $10-15. I suggest spending the night away from the beach, just past the memorial (where there are taps for water available year round) there is a small camping area: quiet, tidy and welcoming. We woke early at 5:00, after a very short and restless night, and started to walk at 6:00. The trail crosses road 4 under a bridge and starts following the Keziv stream east, keeping to the south bank for most of the way. The first 5 km are pretty boring: through banana and avocado groves, and we kept a steady pace until our breakfast of stale pastries and a cold brewed coffee. After reaching road 70, the trail heads to Avadon via the access road for 1.5 km (a mile) until it reaches what many consider the real start of the trail. If you are short on time or not a fan of groves, you can get a taxi or a bus from Nahariya to Avadon and start the walk from here, but you will be missing the Mediterranean side of the whole “sea to sea” walk….. Picking up the trail to Keziv stream – geologist for scale…. bank of the Keziv (green marking). This part of the trail is on a very easy path, usually a 4×4 road or at least as wide, with many shaded parts. There are several springs and pools along the way that you can swim in or at least put your feet in, but in the peak of summer most were dry or very low. Increased pumping in the last decade also means that most of the natural springs are no longer open, changing the stream’s ecosystem. About 5 kms (3 miles) into the stream off the road to Avadon, the trail passes under Monfort, a crusaders’ fort from the 12th century that is still standing proud and high. If you have time and feel like a challenge, it is a hard climb up on an unmarked trail but it is worth seeing. Just walk back down to Keziv stream on the red markings to continue the trail. By this point my walking companion was showing some signs of a stomach problem: bad indigestion or a stomach bug. We stopped at Ein Matzod (Matzod Spring) for a while so he could try to recover and after 30 minutes we continued walking, albeit in a slower pace. Three km later (2 miles) you reach Ein Tamir, a very nice spot for a break and some feet dipping or a swim, as it features a big natural pool. In the winter the area can get flooded so be careful when walking or camping. At the trail junction you can head north on the black trail to Goren settlement or south on the red trail to Mailiya. Stay on the red marking for another km or so to meet the black trail for the climb out of Keziv and to Abirim. At the trail crossing it was becoming clear my friend was not doing well and our pace had slowed markedly; it was also getting very hot by about 13:00 (roughly 38°C/100°F) so we finished the climb and had lunch, which really helped us both, at the edge of road 8925. We had finished the last of our water, but got checked on by local cops to make sure we had enough food and water to continue; we assured them there is a water source near by. 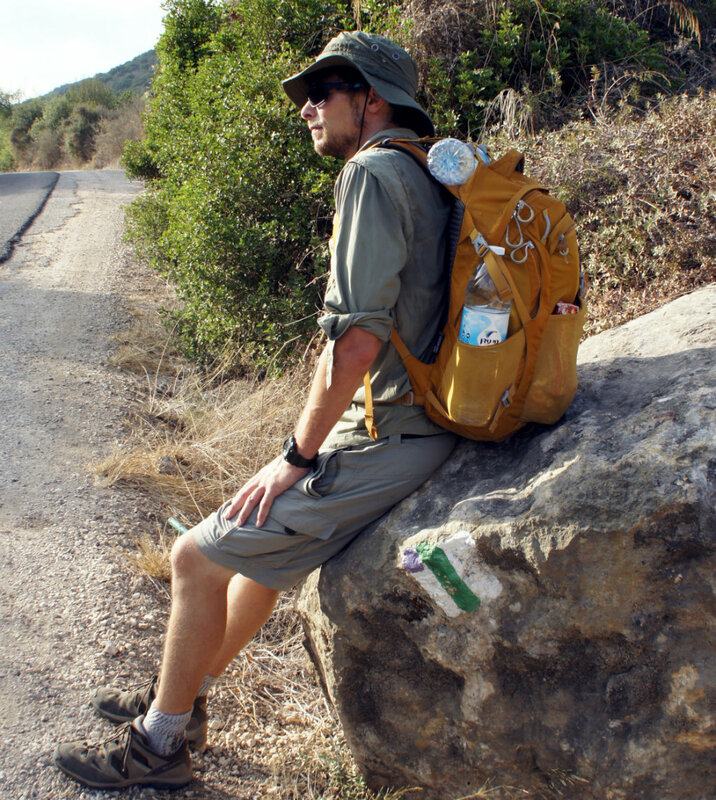 Walking right (south) on the road towards Abirim we found 2 taps with clean but very hot water. We loaded up on water and got ready for the next leg: a sunny and exposed section until rejoining Keziv stream again. The tip about the water source came from calling a local guy who offers rooms for rent in Abirim: Beni (0537315318) for about $15 a night – worth checking if you are need of a shower and rest. From here it was back to the road until we picked up the red trail and then the green trail to go around a one km road walk. This section used to be very nice but it is now completely overrun by local “off grid” farmers; it essentially a demanding descent and ascent on dusty dirt tracks – stick to the road for a few minutes to avoid it and take the green trail heading south. We continued in the less nice area until getting some distance away from the road, especially after missing the trail as another “off grid” farmer decided to cover the trail markings: they are just past the house. The heat was severe at this point and we finally reached the stream again and had some shady walking but my friend needed a break every 2-3 kms (1-2 miles), so progress was slow. After a couple of breaks we realised I had dropped the map somewhere so I left my bag and my friend (who dosed off) and ran back to the last stopping place about 2 kms back – nothing major, but still annoying. It was a slow climb from here for 1-2 kms until reaching Mudregot ruins where we found great fig trees to snack on. At this point it was clear my friend wouldn’t finish the day and we decided to split: he would slowly walk to road 89 and hitch-hike to our night camp spot (Hamamah ruins) while I would walk the last 10 kms and meet him there. Speeding up, I went into a young pine forest for some break from the sun for the next 3 kms (2 miles) on a good dirt road until reaching the big bridge under road 89 and into one of the nicer parts of Keziv stream. About 500m from the bridge the trash is gone and the less used section of the green trail is free to walk on. This part goes through beautifully carved rocks that have been smoothed by the water flow and the Mediterranean forest here is old and established. A few kms ahead is Ein Zvol, an old deserted village that used to be a watering hole for herders back in the day but it is mainly a great swimming place for local kids and worth a bit of a break here. Continue on with the green trail markings until reaching a small c road and the end of Keziv stream (or the start if you take the water’s word on it). The green trail going a bit further and then you have a choice: the green trail along Moran stream or the red trail along Neriah stream. Both are great, with Moran offering a more cultivated landscape, fruit trees and ruins while Neriah offers a wilder and older forest. I picked Neriah and started the 3.5 km climb as the sun was starting to get lower behind me. The climb was hot and humid but the vegetation around me was magical – this is truly one of the highlights of the trail. I finally emerged near the field school around 19:00 and found my friend waiting for me (he only beat me by a bit). We spent the night in Hamamah ruins near the field school (which offers accommodation). There are running water taps, concrete seating and tables but no toilets so good LNT practices are vital. The place was a bit busy when we picked our spot, but got quieter and finally empty as the dark settled. We had a slow evening that included a cold dinner (stoveless) that we scarfed down, some Pat’s beer and a field shower for me which really helped pick up my spirit. We retired for the night but I quickly discovered that even with all my clothes and my flimsy blanket I was cold, it was going to be a restless night….. I spent a cold night shivering under my thin and useless sheet but my friend had a solid night’s sleep and he was feeling better, well enough for us to enjoy the second half of the trail: walking up to the peak (ish) of Mt Meron and east to the sea of Galilee. We packed slower but had a good breakfast and some coffee, filling up all the water containers we had and started climbing. It is a bit of hard climb 0f 250 meters along 2.5 km, following the black markings (and the Shvil Israel markings) until reaching Mt Neriah – a secondary peak. We started early and met a very uncharacteristic low cloud for the middle of August that made sure we got all the humidity we could want. By the time we reached Mt Neriah I was drenched in sweat. From Neriah it is a bit longer until the Peak trail: a red marking for a trail that goes around the peak of Mt Meron. You can’t actually reach the top of the mountain as it belongs to the air force and it is restricted. The recommendation is to walk on the north and eastern part of the peak for the views and the sunshine but we had been there so many times we chose the shaded loop on the south. We joined the road that heads east to the parking area where you can find another picnic area and water taps, very useful if you want to camp further east as there are no more easy filling points for 5 kms. We filled our bottles again and headed out into the ever-warmer morning, but at least it was getting dry as the weather there is no longer influenced by the sea but by the inner Jordan valley. The walk from here is very straight forward, following the green markings (and Shvil Israel) all the way to Zeved pool – a natural pool that is full to the brim in winter but drains and gets totally dry by summer. When we passed the area we noticed signs of a badly executed trail running race with trash and signs along the way – I hope that was cleaned up later on. Along the way there are several fruit trees that you can snack on. From Zeved pool, take the black trail to Meron settlement along the ridge and down to the camping area. Halfway through this section is an old well that is called Kise’h Elyahu (Elyahu’s or Elijah’s Chair) with a beautiful old oak growing out of it and amazing views to the east. This place was my original planned camping spot if my friend had been well and we could have covered the 8 kms (5 miles) from Hamama ruins. 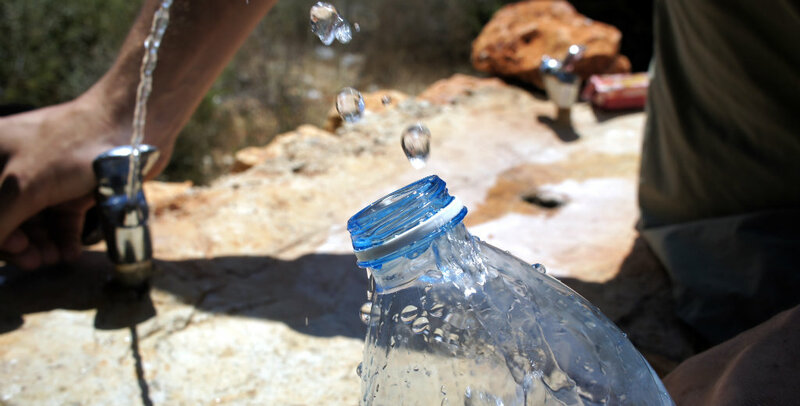 In the Meron camping area you can find more water so we topped up our bottles and had a quick rest – it was getting hot at this point and we didn’t want to increase the chances of heat strokes. From here it is onto the black trail and into the Meron streambed for a couple of shaded kms until meeting Amud stream near Ein Yakim. I personally love this section from Meron to Yakim as it is an area of old habitats, full of old groves, bridges and buildings with nature slowly reclaiming it. Near Yakim we headed south, continuing on the black trail (and Shvil Israel) on the upper Amud stream, passing Sechvi pools that are usually a great place for swimming with natural stone slides but it was now deserted, dry and with some sort of pollution in the water that has apparently been harming the local fish population. The area is still amazing and here you can climb out of the trail to Zafat on a blue trail; which is what my wife and I did last time walked the trail as it had too much water to continue (in mid winter). 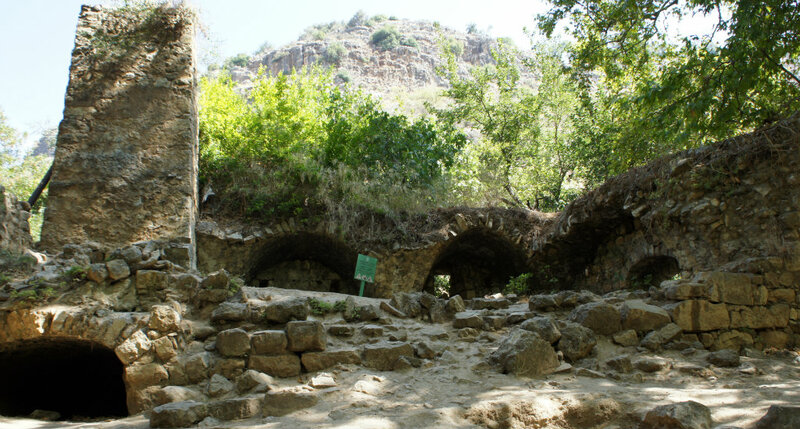 Heading south, we left the comforting shade to reach the middle Amud stream – a rugged, exposed and rocky path. We slowed our pace dramatically here as you need to cling to rock, use bolts and pay close attention to your footing. At some point we also made a wrong turn, almost sending us several tens of meters down onto the rocks below. At this point we had a regrouping break, drinking some water, checking our physical status and evaluating time. It was 11 am and reaching 40ºc (105ºf) according to my watch; we were sweating buckets, making poor judgement calls and were down to 3 litres of water each – so we decided to skip the last section. It was another 3 km to road 85, a major road in the area, where we decided to finish our walk and avoid the last 7 km of the lower Amud stream – a highly exposed and heat stressed area. The walk to the road was harder by the minute due to the heat, and it took us almost an hour to cover a mere 3 km (2 miles)! We made the right decision to call it off, especially as my watch was showing a temperature of 43ºc (110ºf). There is a huge new bridge over Amud stream and the trail (black markings) climbs to a parking area near the road and then a hikers tube under the road and back down to the stream – this is a waste of time, just stay in the valley and under the bridge, there is no need to go up as the parking area has no water anyway. Road 85 has been remade into a big freeway and the nearby junction (Kadarim) is now an interchange, which made hitch hiking out of the area very hard, even with buses around. After 20 minutes of cooking in our skins on the open road we walked the 1.5 kms to the interchange and tried to make our way to the bus station on the higher road, all the while trying to catch a ride. Eventually we caught a ride south and out of the sun, drinking the last of our water. As I mentioned, water is the biggest issue on this trail, but there a few more such as language, maps and information. Information is available about the Yam le Yam trail in abundance, but it is mainly “common knowledge” information and it is almost all in Hebrew. I hope some of the following information will help. Language is a major barrier despite the fact that English is one of Israel’s official languages. Road signs have English writing on them but smaller, more local signs and extra information will all be in Hebrew. Many people along the way will speak some form of English, even if very broken, so asking for translations is recommended and will be happily supplied. Buses and most public transportation will be in Hebrew with hardly, if any, information in English so ask in the various stations which bus or train you need to take. Knowing some Hebrew will help along the trail but asking people will help the most, don’t be shy as Israelis will welcome questions and will go out of their way to help a tourist. Topographic maps are only available in Hebrew and are offered by the Society for the Protection of Nature in Israel (SPNI) and Shvilnet. I’m now in touch with Shvilnet to try and find a way to make the Yam le Yam map usable to English speakers so keep an eye here or let me know if you are interested in that. These are all the water sources on the trail so carrying extra collapsible containers is very recommended. I carried 7 litres of water at a time and refilled them (all of them!) every time I reached a water source. The recommended load of water per person per day in Israel out of the winter. In summer this is a half day consumption…..
All and all walking the Yam le Yam is simple and rewarding, especially if you don’t try to do it in the peak of summer or winter. Despite not finishing the trail it was a very nice trip, remembering the challenges and joys of walking in hot conditions and the beautiful nature areas in Israel which are slowly shrinking. I would highly recommend doing this walk if you are coming to Israel any time soon. Want to make sure you won’t be missing the next posts when they are available? I’m afraid not Mike, there wasn’t much interest and Shvilnet weren’t interested in working together on a translation. I can try and help you with a few details if you want. I used to live in Israel some ten years ago, and we did occasional tiyulim. I must have done parts of this trail, as I clearly remember the Monfort! Doing it in heat of the summer, though… o_0 I only once went for a hike in August – to Ein Gedi. My goodness, it was absolutely a nightmare, with no shade to hide. Ein Gedi in the summer is actually the worst (more so than Yam le Yam), so no wonder you have no fond memories from the hike…. Glad you enjoy the site.